Arrow Farmquip ’s Beef Buddy cattle handling system takes advantage of cattle’s natural tendency to move back in the direction they came from. This cattle handling system revolutionizes the way producers handle their cattle. It makes it easier, safer and minimises animal stress. 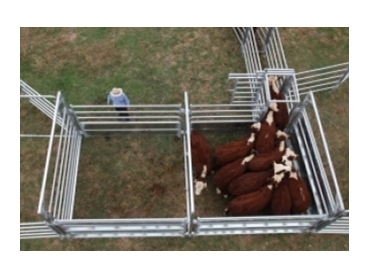 Cattle enter into a box-type pen with filled-in sides and a gate at the end made of rails. This allows the cattle to see out of the pen. Once the cattle get to the gate they find they can’t get through and turn around to where they came from. By that time, the handler has shut a gate at the entrance. So the only way of escape is the race opening near the entrance. The cattle handling system creates a continuous flow of cattle into the handing race.